All Christians agree that Jesus fulfills the expectations of Psalm 2, but it’s debated if this reign has already begun or whether it entirely awaits His return. Much hinges on how one interprets NT quotations and allusions to Psalm 2 (e.g. Mk 1:11; Acts 13:33), although this does not exhaust the discussion. Other related texts and concepts help shed light on the question. One concept is that of Zion. An argument that Christ is not currently reigning is that the reign takes place in Zion (Psalm 2:6). Doesn’t this conclude that, unless one wants to fudge the details, since Christ is not in Jerusalem He has not begun His Ps 2 reign? George Gunn makes this argument in his BSAC article, “Zion in the Bible never refers to heaven (except in Hebrews 12:22, where it is used symbolically)”. Personally, I’m not so sure it’s that simple. I’m still working through the issue but here are a few thoughts in development. Romans 11:26. I read this passage as the salvation of all ethnic Israel soon before or concurrent with Christ’ second coming. In Romans 11:26, Paul quotes Isa 59:20 but changes “to Zion” to “from Zion” in his quotation. Though some see “from Zion” as referring to salvation spreading from Jerusalem to the ends of the earth, I think it is better to see this as Christ’s return from heaven to earth. If correct, Paul is using “Zion” to refer to heaven. Psalm 110. The question of when Jesus fulfils the Ps 110 reign is very much related to Psalm 2. If one agrees Jesus as presently reigning in a beginning fulfillment of of Ps 110 (which 1 Cor 15:25 appears to indicate), then He is reigning “from Zion” (Ps 110:2); that is, in heaven. Revelation 14:1. Is the reference here to physical Jerusalem? I’m not sure. Hebrews 12:22. Gunn admits to Heb 12:22 being an exception. We’ve already seen with the three texts above that it is probably not alone. With Heb 12:22, Gunn admits that Zion is used symbolically. He appears to think that the presence of symbolism excludes Heb 12:22 from speaking to the question in any significant way. I’m not sure why, since if “Zion” here even symbolises heaven, then doesn’t this undermine Gunn’s point? Isn’t this the question under discussion? There is an extremely close connection with Zion and Jerusalem. If we broaden the horizons and allow Jerusalem to come into the picture, two more texts become relevant. Galatians 4:21-31. In this text, Paul distinguishes earthly (“present”) Jerusalem from “the Jerusalem above”; that is, in heaven. Revelation 21-22. In Rev 21:2, 9ff a renewed Jerusalem comes to earth from heaven. 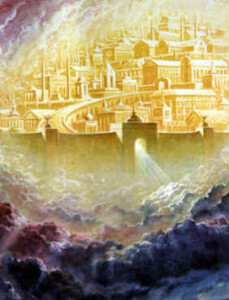 It seems reasonable then to conclude that a New Jerusalem is currently in heaven and awaits its unveiling in the New Creation. So we have seen that Zion is in some way equated with heaven as well as the New Jerusalem that will come from heaven to earth. But how is this the case? Is there any logic behind this connection? “Prepared” in Heaven. Often heaven is the place where our wonderful future is being “prepared” (Rev 21:2) or “kept” (1 Pe 1:4). Words like “inheritance” (alluding to the promised land) are surely relevant here (Col 1:12, Eph 1:11, 14, 18; Gal 3:18). Our new resurrected bodies are being prepared in heaven (2 Cor 5:1-5). Paul connects the resurrection of believers with the new creation (Rom 8:19-25) and note that Rom 8:16-17 ties new creation with inheritance language). All this to say, the New Heavenly Zion/Jerusalem is also being prepared in Heaven. The “World to Come”. Though debated, it appears that Hebrews 1:6 refers to Jesus’ entrance into the new creation in His ascension. Hebrews 2:5-9 refers to this as the “world to come”. Does this mean that Jesus’ entrance into heaven was an entrance into a New Zion being prepared in heaven? It seems that Jesus is present specifically in the New Zion/world to come, which is being prepared in heaven and will be unveiled on earth (Rev 21-22). It was upon entering this world that Jesus was raised above all other heavenly beings (Heb 1:3-4) and enthroned as the king over the new creation (Heb 1:5-9; 2:5-6). In putting all of this together, it appears that Christ is currently reigning from Zion in a very real and literal sense! This is not spiritualizing the text, though perhaps it is eschatologizing it, by recognizing the development of Zion throughout Scripture. The true transformed Zion is currently in heaven, being prepared by God. Jesus as the first fruits of the new creation is currently there, reigning and ruling. His rule will continue when the heavenly Zion descends to earth, thus fulfilling all expectations of His glorious and earthly rule in Zion on the earth. If I’m correct, Psalm 2:6’s reference to Zion does not prevent one from recognizing Christ’s Psalm 2 rule has begun with His resurrection and ascension to heaven, since He is currently in the New Zion. However, the story does not end there. Christ will return, the New Jerusalem will descend to a new earth, and Christ will reign here with His people.